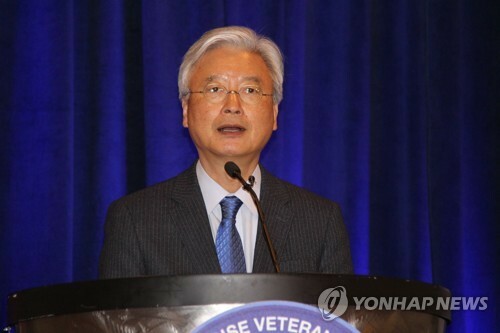 WASHINGTON, Oct. 17 (Yonhap) — The United States and North Korea are expected to meet soon to hammer out the details of a planned summit on the regime’s denuclearization, Seoul’s top envoy to Washington said Wednesday. The U.S. appears confident that the working-level negotiations will take place in line with an agreement reached by U.S. Secretary of State Mike Pompeo and North Korean leader Kim Jong-un earlier this month, Amb. Cho Yoon-je said during a regular press briefing. “I expect the North Korea-U.S. working-level talks to begin soon,” he said. On the U.S. side, the negotiations will be led by Special Representative for North Korea Stephen Biegun. The North is expected to be led by Vice Foreign Minister Choe Son-hui. The meeting could determine the date and venue of U.S. President Donald Trump’s second summit with Kim. At the first summit in Singapore in June, Kim committed to work toward “complete” denuclearization of the Korean Peninsula in exchange for security guarantees from the U.S.
Trump has said that the next summit will happen after the U.S. midterm elections on Nov. 6. The venue has been narrowed down to three or four locations, likely not in the U.S., according to the president. Cho said the U.S. views the recent high-level meeting among North Korean, Chinese and Russian officials as a positive step that could help the North’s denuclearization. “I think that reflects U.S. confidence that U.S.-North Korea negotiations are making significant progress compared to the past,” he said.